Cupcake with cocoa powder, kahlua and coffee. Frosting with mascarpone cheese and flavored with amaretto. 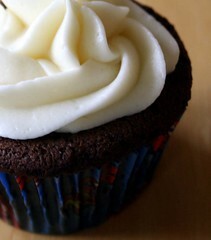 The cake recipe can be found in the book "Crazy About Cupcakes."